Do You Think The Stock Market Could Fall to 11,000? 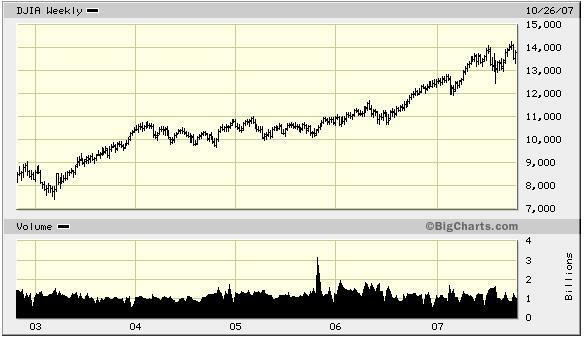 This is a Chart of the Stock Market (The Dow Jones Avg.) since the most recent market bottom in early 2003. The stock market has risen every year for the past 5 years. If the stock market would fall to 11,000 – that would be 2,806 points down or 20.3% – If that happened most people would loose their jobs, because the credit markets would tighten, borrowing money would all but disappear and consumer confidence would crash and everyone would pull back and not spend any money. If this happens the Federal Reserve Bank will print more money (why not they can do it) and the U.S. Dollar will decline even further – The value of our money if becoming worthless becuse when the Fed prints more money, it is not tied to anything material – they just decide to print more, and the more money there is in circulation, the less it is worth – Basically what we have in our pockets and bank accounts is slowing diminishing – better start saving harder. Crude Oil Rises to Record above $92.50 a barrel in New York after Turkey’s Foreign Minister said his government is considering “all options” including military action to deal with Kurdish rebels operating from Iraq. Crude oil for December delivery rose as much as 93 cents, or 1 percent, to an all-time high of $92.79 a barrel in after-hours electronic trading on the New York Mercantile Exchange. It was trading at $92.63 at 10:14 a.m. Singapore time. the 3 month T-Bill is now yielding only 3.85% as of today’s Interest Rates on Bloomberg -which is saying there is a flight to quality in the bond market. Did you hear the recent announcments of the major right offs (Losses $$) by all the big Banks in the past week or so – several hundred millions lost for each bank due to the Credit Crunch.